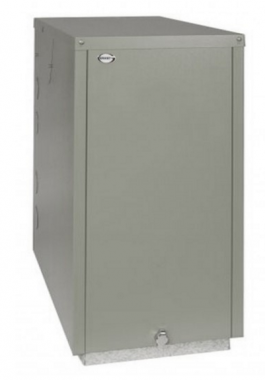 The Vortex Eco External Regular oil boiler is a floor standing, condensing boiler which has been designed to be placed outdoors to help save you space in your home. Manufactured by Grant, this highly reliable unit includes a variety of features and benefits such as the award winning Vortex condensing heat exchanger, market leading Riello blue flame burner, a main isolating switch and a test switch, factory fitted multi directional flue and high quality external powder coated casing helping to protect the unit all year round. In addition the unit comes with built in frost protection to stop your boiler from freezing over in the cold winter months when you need the boiler the most. The efficiency rating of this boiler is 92.4% which makes it A rated. The output rating of 26kW to 25kW makes the unit perfect for medium sized homes with not such a high demand for hot water or heating. As a System boiler it directly heats your central heating system and produces hot water for your storage cylinder. The most important parts of the hot water and heating system such as the pump and expansion vessel are built in on a system boiler making it quicker and cleaner to install. This also means you get a faster response to demand for heating and hot water and you don't need to have a feed and expansion tank in the loft. This boiler comes with 2 years warranty so you can be sure you're purchasing a highly reliable unit that won't let you down.